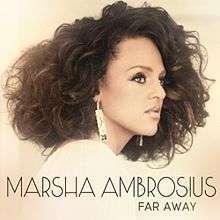 "Hope She Cheats On You (With A Basketball Player)"
"Far Away" is a song by English recording artist Marsha Ambrosius. It was released on December 7, 2010 as the second single from her debut studio album, Late Nights & Early Mornings. The album was subsequently released on March 1, 2011. The song was written by Marsha Ambrosius with co-writing by Sterling Simms and production by Just Blaze, in 2008. The song was nominated for Best R&B Performance and Best R&B Song at the 54th Annual GRAMMY Awards. The track was inspired by one of Ambrosius's own friends who committed suicide, and discusses how it feels once someone she's loved is gone. "Far Away" is a mid tempo R&B song with its lyrics constructed in the common verse-chorus form. The official remix features rapper Busta Rhymes on the intro & 1st verse was leaked online on April 8, 2011. An audio track of the remix premiered on May 23, 2011 on Marsha Ambrosius' Vevo account. It was released on May 31, 2011 as a digital download single. The music video to "Far Away" premiered on Vevo, Wednesday, January 6, 2011 and sparked lots of controversy towards the concept which involved an African American gay couple, bullying, and suicide. The video featured a written appeal by Ambrosius exhorting viewers to put a stop to bullying and homophobia and prevent suicide, and posted the phone number and URL of the National Suicide Prevention Lifeline at suicidepreventionlifeline.org. The video was nominated for Video of the Year at the BET Awards of 2011. ↑ Far Away - Single by Marsha Ambrosius itune.apple.com. Apple, Inc. Retrieved 1-20-2011. ↑ Nessif, Bruna (30 November 2011). "Complete List of Nominees for the 54th Annual Grammy Awards". E! Online. Retrieved 30 October 2012. ↑ "Singer Tackles Gay Bashing, Suicide in New Video - ABC News". Abcnews.go.com. Retrieved 2011-04-02. ↑ Ziegbe, Mawuse (2011-02-10). "Marsha Ambrosius Is Glad 'Far Away' Video 'Got People Talking' - Music, Celebrity, Artist News". MTV. Retrieved 2011-04-02. ↑ "Video of the Year – BET Awards". BET. Retrieved 2011-11-21. ↑ "Marsha Ambrosius – Chart history" Billboard Hot 100 for Marsha Ambrosius. ↑ "Marsha Ambrosius – Chart history" Billboard Hot R&B/Hip-Hop Songs for Marsha Ambrosius. This article is issued from Wikipedia - version of the 9/4/2014. The text is available under the Creative Commons Attribution/Share Alike but additional terms may apply for the media files.